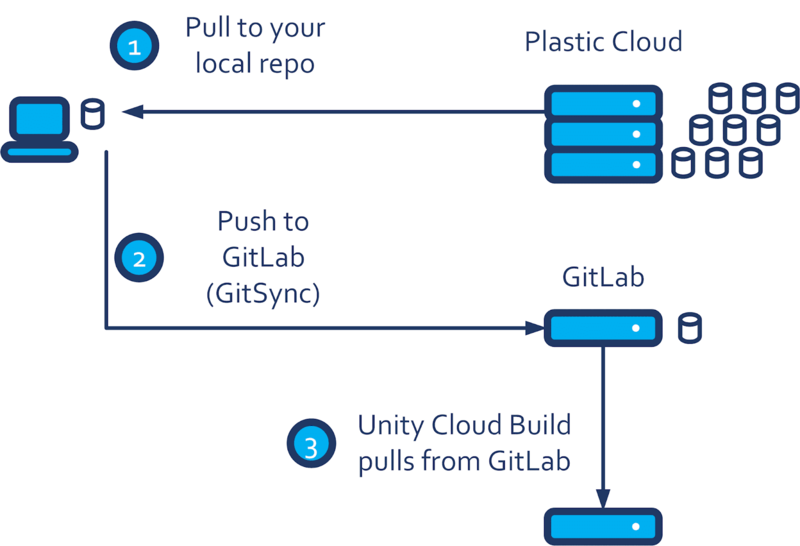 This blog post explains how to build your Unity project stored inside a Plastic Cloud Edition repository. Unity Cloud Build does not provide native support to download code from Plastic, but it is possible to take advantage of the Plastic ability to synchronize with Git to solve the problem. 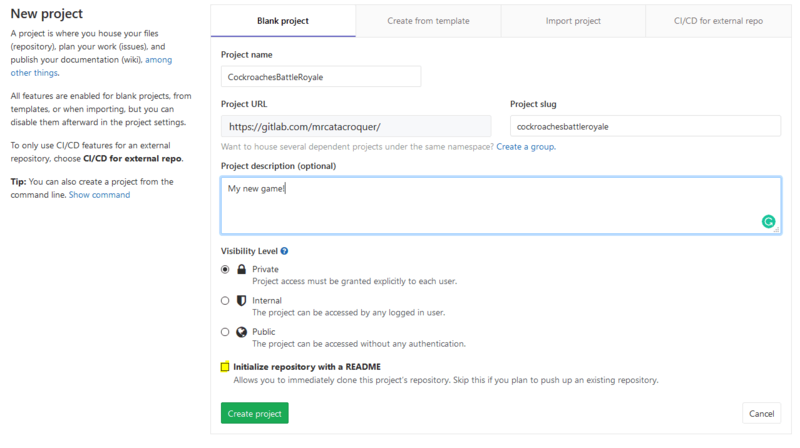 We explain how to use GitLab as an intermediate storage for Plastic repos so that Unity Cloud Build can access them. The workflow is simple—all the development will take place inside Plastic SCM. Developers and artists will work together using the same repository and one day they will ship a cool game. To achieve this, the game has to be properly built and tested multiple times before the release date. And, that's where Unity Cloud Build enters the scene. Unity Cloud Build provides a great platform to build and test the game; the only issue is you can't connect it to Plastic SCM (yet!). We will use GitLab, GitHub, Bitbucket or any other Git hosting service as a bridge between Plastic Cloud and Unity Cloud Build. Every time the team needs a new build, they will synchronize the Plastic Cloud repository with the Git cloud repository. This action triggers a new Unity build because Unity Cloud is constantly checking for new changes to appear. Let's review it in depth. Plastic supports the GitSync feature. GitSync allows the Plastic SCM user to sync a Plastic repository with a Git hosted repository. We will use GitSync to push the Plastic SCM changes to the Git hosting service to trigger builds for Unity Cloud Build. I chose GitLab as the bridge between Plastic SCM Cloud and Unity Cloud Build because this is what one of our customers suggested. They are actually using this setup. They are using a Free intermediate GitLab repo to achieve it. The following figure shows how you can create a free private repo to send your projects to Unity Cloud Build. A few remarks: it is mandatory to initialize an empty Git repository; skip adding any gitignore, readme or license files since the Git repository will synchronize with the Plastic SCM repo, which already contains all the data and history needed. Finish the configuration defining the build target information. Here, you can specify the branch to track for new changes. Now that Unity Cloud Build is monitoring the "master" branch, it's time to make it work. To trigger a new build, we need to GitSync the Plastic repo to GitLab. The Plastic GUI allows you to do it even from Unity. 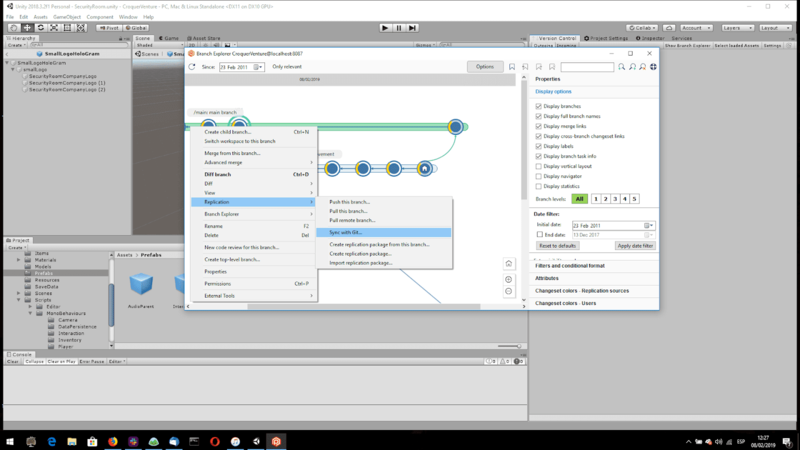 Open the Branch Explorer (the action is inside the "Version control" view). From the Branch Explorer, select any of your branches and select "Replication -> Sync with Git". This will synchronize the entire Plastic SCM repository with the Git repository. It doesn't matter which branch you choose to run the operation; the GitSync operation applies to all the repository at once. Why not use GitLab directly then? You might wonder: ok, if I already have my repos in GitLab, why shouldn't I simply skip Plastic altogether and just keep my projects in Git? It's much easier to create and update branches. It's visual and makes tracking changes much faster. The automatic merge does a great job. You can see what's going on in the project in seconds. Big files support, for real; no patches or workarounds. I'm in charge of the Customer Support area. I deal with complex setups, policies and working methodologies on a daily basis. Prior to taking full responsibility of support, I worked as software engineer. I have been in charge of load testing for quite some time, so if you want to know how well Plastic compares to SVN or P4 under a really heavy load, I'm your guy. I like to play with Arduino GPS devices, mountain biking and playing tennis. You can find me hooked to my iPhone, skate-boarding or learning Korean... and also here @mrcatacroquer.